What is the vineyard register? 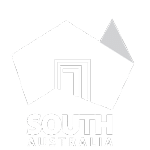 Vinehealth Australia is required under the Phylloxera and Grape Industry Act 1995 (Act) to maintain a complete and accurate register of vineyards in South Australia. Information is stored on the Vineyard Register. An up to date Vineyard Register enables Vinehealth Australia to work together with industry to prepare for and prevent an outbreak of a significant pest or disease. In the unfortunate event of a phylloxera or other significant pest or disease outbreak, the register is vital in ensuring Vinehealth Australia can quickly contact vineyard owners with relevant information or instructions. This will help manage and minimise potential impacts of the pest or disease on vineyard owners and the broader industry. A person or organisation who owns land with 0.5 hectares or more of planted vines (Registered Land Owner) is required by law to provide Vinehealth Australia with an accurate Vineyard Record, containing contact and planting details, which are entered into the Vineyard Register. A maximum fine of $1,000 or three months’ imprisonment, applies for non-compliance with this requirement. Any changes made to planting details including area (hectares) by the Owner within three months of the change occurring. The register contains electronic versions of individual vineyard maps, as well as details of plantings, varieties, hectares, rootstocks, locations and ownership and can be updated at any time. Information stored in the Vineyard Register is protected by The Act and cannot be shared with anyone other than the Registered Land Owner, without written authorisation by said land owner. What is the Annual Vineyard Record Return? 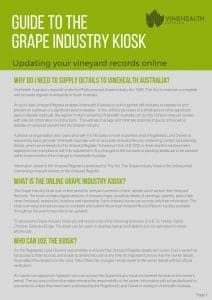 Each year, Vinehealth Australia asks owners to review and update their information, contact and planting details, in the Vineyard Register. To assist owners to fulfil this obligation, Vinehealth Australia sends the annual Vineyard Record Return via hard copy, or by electronic copy dependent on the preferences of each owner. The Return can be completed online via the Grape Industry Kiosk accessed on the Vinehealth Australia website. Each owner has full access to their records and can amend them at any time. It is important to know the owner details must reflect the details held by the Land Titles Office. An owner can appoint, in writing to Vinehealth Australia, an operator and/or administrator who can access the vineyard records via hard copy or through the Grape Industry Kiosk and amend records on the owner’s behalf. The accuracy of the information remains the responsibility of the owner. Each user will have a unique login ID and password. Any changes are recorded and submitted for final approval by Vinehealth Australia. Please see both the Guide to the Grape Industry Kiosk, and the Submitting Records Troubleshooting Guide below for details on amending information. As always, we welcome any Feedback to enhance the Kiosk.